Editor's note: Today’s guest blogger is Adam Ratana, developer of Sun Surveyor. Read how Sun Surveyor is using Google Maps APIs to help photographers capture the perfect photo. I’m a photography enthusiast, and I’m always looking for ways to improve my work. That’s what led me to develop Sun Surveyor, an iOS and Android app that uses Google Maps APIs to visualize the location of the sun and the moon anywhere in the world. The app makes it easy to figure out when the natural lighting will be just right — and get the ideal shot. Sun Surveyor uses augmented reality to overlay the paths of the sun and moon on a camera’s view, so you can see where in the sky they’ll be at a specific time and place. 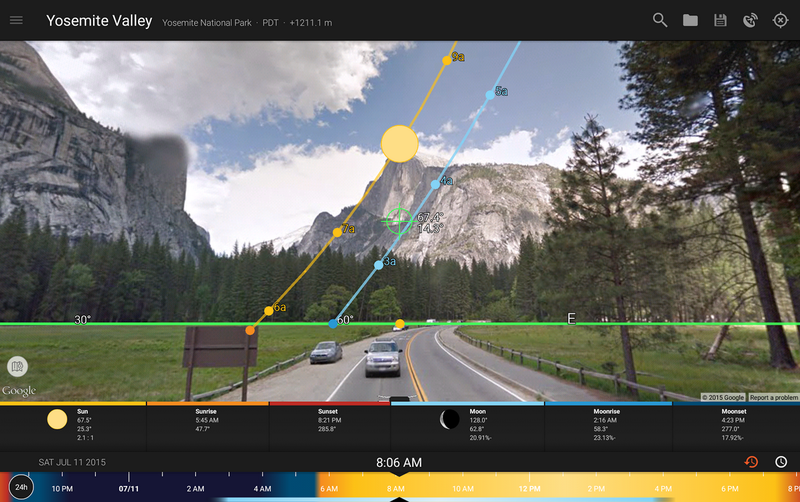 Photographers can use it to plan their shots ahead of time, and businesses can use it to gauge things like how best to align solar panels to make the most efficient use of the angle of the sun. The app uses multiple Google Maps APIs, including the Elevation API, the Time Zone API, the Google Maps SDK for iOS and the Google Maps Android API. The Android API, which includes Street View, was particularly helpful. It allowed me to overlay the path of the sun and moon on any Street View location anywhere in the world. For programming details, see this blog post. The following screen captures give you a sense of how the app works. They show overlays on top of the iconic Half Dome in Yosemite National Park. 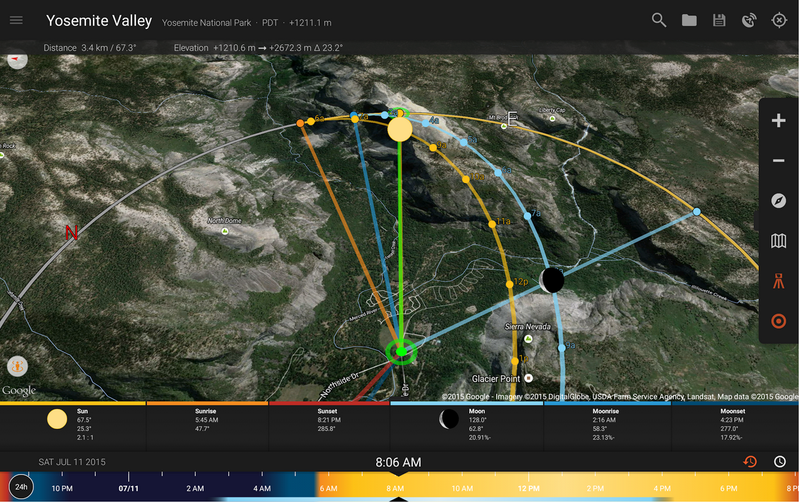 The first shows the paths of the sun (yellow line) and moon (blue line) over an aerial view of Yosemite Valley. The green line shows the distance between the photographer and the object to be photographed — in this case, Half Dome. This next screen capture shows how the app looks when in Street View mode. Again, the yellow line shows the sun’s path, and the blue line shows the moon’s path. The green line represents the horizon. You can see how the app lets you plan the right time to get a shot of the sun behind Half Dome: in this particular instance, 8:06 am. Nearly 500,000 people around the world have downloaded the free version of Sun Surveyor, and many have paid for the full edition. They’re taking remarkable photos as a result, and what started as a hobby for me has turned into a business — thanks to Google Maps APIs.